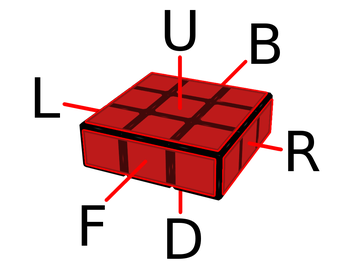 The 3x3x1 is a cuboid, called Floppy Cube, and is based on a 3x3x3 cube. The axis is fixed, so the centres (and therefore the faces) are defined. In this type of cuboids the moves are always 180 degrees. The faces are the surfaces with several stickers. Floppies have 6 faces, two of which have 9 stickers and the rest have three stickers each. In this guide the F face will be one three-stickers face and the algorithms are based on that. In the Floppy cube there are three types of pieces: Centres, Edges and Corners. Unlike a 3x3x3 cube, in this case there are only 2 centre pieces, with one sticker each. They are located in the 9-sticker faces, called U and D.
They are different from the 3x3x3 edge pieces, since in this case each edge has 3 stickers. They are different from the 3x3x3 corner pieces, since in this case each corner has 4 stickers. where x indicates rows and y indicates columns. For instance, the piece (2,3) is the one placed in row 2, column 3. Turns are the moves the pieces make. In the 3x3x1 the only possible turns are double (180º). 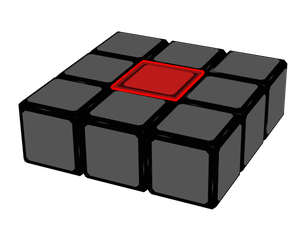 Since there are some Floppy models (the Super Floppy Cube) that can turn 90º without blocking the cuboid, we will still write the letters with a number 2 (i.e., F2, R2, L2, etc.) to indicate the move.